The Freistadt Danzig (Free City of Danzig) issued the three stamps shown above on February 22, 1938 to commemorate the 150th Birthday of Arthur Schopenhauer. Arthur Schopenhauer (1788-1860) was a Danzig-born German philosopher and author. His writings have influenced such thinkers as Friedrich Nietzsche, Richard Wagner, Ludwig Wittgenstein, Erwin Schrödinger, Albert Einstein, Sigmund Freud, Otto Rank, Carl Jung, Joseph Campbell, Leo Tolstoy, Thomas Mann, and Jorge Luis Borges. The five Winter Relief charity stamps, shown above (Mi. #284-88, Sc. #B28-32), were issued on November 28, 1938. They were printed in Berlin on unwatermarked paper. 05 Pf. + 05 Pf. - "Peter von Danzig" Yacht Race. 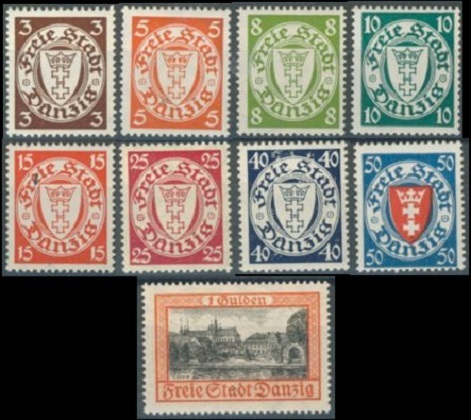 The nine Danzig Coat of Arms and Scenic type definitive postage stamps shown above (Mi. 289-97, Sc. #225-33) were re-issued, beginning in July 1938. These new stamps were printed on paper with the multiple swastikas watermark. The 05 Pf. and 10 Pf. denomination stamps were also issued in vertical coils with syncopated perforations (Mi. #290D, #292D, Sc. #226b, #228b). The current Danzig airmail stamp denominations shown above (Mi. #298-01, Sc. #C42-45) were also re-issued, beginning in July 1938. 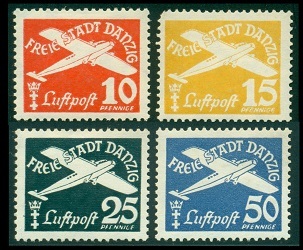 These new airmail stamps were also printed on paper with the multiple swastikas watermark. The four stamps shown above (Mi. #302-05, Sc. #234-37) were issued on January 7, 1939 to celebrate Stamp Day. 05 Pf. - Knights in a tournament (c. 1500). 10 Pf. - Signing of the Danzig-Sweden neutrality treaty (1630). 15 Pf. - The French leaving Danzig (1814). 25 Pf. - Battle of Weichselmunde (1577). The three stamps shown above (Mi. #306-08, Sc. #238-40) were issued on April 29, 1939 to honor the Achievements of Gregor Mendel (1822-1884), Dr. Robert Koch (1843-1910), and Wilhelm Roentgen (1845-1923). 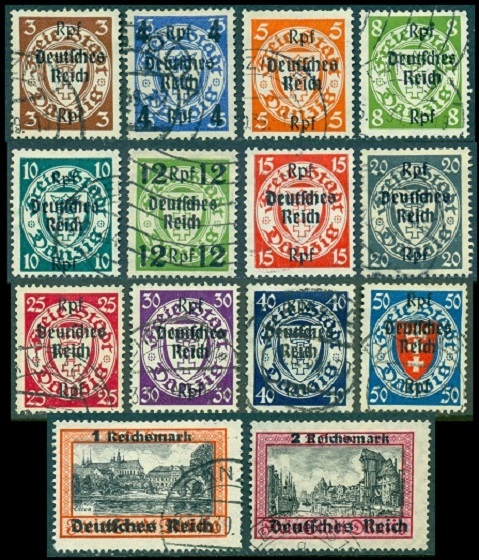 These would be the final postage stamp issues of the independent Freistadt Danzig. At the beginning of September 1939, the Danzig NAZI Party leader, Albert Forster, entered the League of Nations High Commissioner's residence and ordered him to leave the city. The Freistadt Danzig ceased to exist as an independent political entity. The former Free City was formally incorporated into the German Third Reich as part of the newly-formed Reichsgau of Danzig-West Prussia. The two stamps shown above were issued by the Third Reich on September 18, 1939. They celebrate Danzig's Incorporation into the Third Reich. 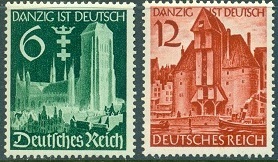 On September 28, 1939, the Third Reich overprinted and / or re-valued existing stocks of Danzig definitive postage stamps, indicating that the former Free City was now part of the German Reich. They are all shown above (Mi. GERMANY #716-29, Sc. #241-54). 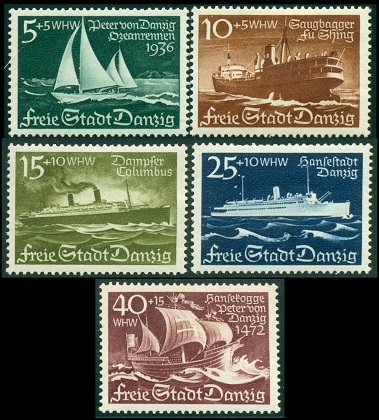 After this date, the postage stamps of the Third Reich were used in Danzig and its surrounding areas.